I suggested that coding a geometry concept in Scratch is a higher-level cognitive task than just memorizing a geometric definition. Here is a third example called Parallel Mouse. 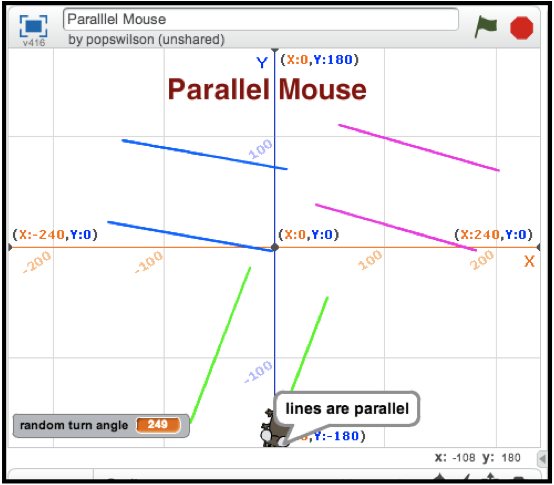 As the screenshot shows, a mouse (seen in top down view) constructs three pairs of parallel lines. The code that directs the mouse to do this is simple and is a good example of sequencing as a programming skill. The project itself can be viewed and downloaded by clicking on this link. If you view the project in action, the mouse will report that as it draws a line and then goes to a random point on that line, it turns left 90º, lifts the pen, moves forward a given distance, turns right 90º, and then draws the line parallel to the first line. Asking young students to code parallel lines is a good programming exercise but my project can be taken a step further. It can be generalized in the sense that the mouse can turn through any angle, say angle x. In figure (a), the mouse has drawn the first line and moved to a random point on the line. In (b), the mouse has turned left through an angle, xº. In (c), the mouse moves forward a given distance to another point. Finally, in (d), the mouse turns right xº and is in position to move back and forward to draw the line parallel to the first line. If the diagram (d) is looked at as parallel lines cut by a transversal, then it can be seen that the corresponding angles are equal! Math texts simply state that fact about corresponding angles whereas the young Scratch programmer, if asked to code a program that constructs parallel lines, can discover that fact for themselves.